Being an A-List celebrity, having fame and fortune does not make you immune to or unaffected by the senseless murders of Alton Sterling in Houston or Philando Castile in Minnesota. It doesn’t stop you from sympathizing with the senseless killings of the police officers in Dallas and when you are African American you know that with all of your success, fame and notoriety you or your family members are possibly one police stop away from possibly facing the same tragic fate. Cedric “The Entertainer” and his friends (famous or not) found themselves having the same conversation that most of us have found ourselves having over the past week and a half. They found themselves having the same discussion we’re all having, the one that has been going on in living rooms, Starbucks, and Black barbershops and beauty salons within our community for years. This is tragic, it has to STOP, but what can we do? Well Cedric along with several of his friends including Omar Epps, Marlon Wayans and Tasha Smith decided to have over 100-150 of their closest friends and colleagues come together in a few days’ notice to discuss these tragedies, educate themselves to the legal issues that face our community and collectively call for an end to these tragedies both at the hands of and against the police. In a Sentinel/LAWT exclusive interview, Cedric explained the idea behind the meeting, the plan going forward and the concerns that each and every one of them have regarding the issues facing our community. When asked why was this meeting called Cedric explained “first and foremost we want people to understand that we all have a concern about the unnecessary violence which is happening at the hands of those people who are supposed to be protecting us and we wanted to discuss what we as celebrities could do with our platform to bring about change.” “We understand that individually we are but 5 fingers but together we are one strong and powerful fist and most importantly we want our fans to understand that we as a group of Hollywood Stars stand in solidarity with our fans and our community”. All of the celebrities in attendance recognize that these attacks are senseless, that we don’t need our people killed at the hands of the police and we as a people also can’t and shouldn’t be retaliating by killing police officers. “We feel for our brothers in Minnesota, in Baton Rouge, but we also feel for our brothers who are being killed that the media is not discussing. Our Mexican Brothers who are being killed, the man who was hung from a tree in Atlanta, the police who were gunned down in Dallas and in Baton Rouge. We feel the rage and we have to bring an end to this rampant violence,” Cedric said. The group had serious concerns about the way Black People in particular are being handled and killed by those who have been sworn to “protect and serve”. “We have a problem with these egregious killings, when police are able to determine if you live or die. Right now some police officers get to act as judge, jury and executioner all at the same time. They are able to determine if you live or die”. 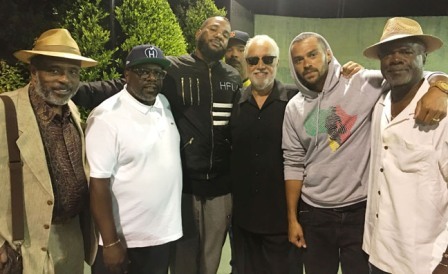 That is why along with several celebrities, attorneys, politicians and community activist including Sentinel Executive Publisher and Board Chairman of the Los Angeles Brotherhood Crusade Danny J. Bake­well, Sr. were invited to the meeting. “It was so good to see all of these Black Men and Women come together to stand up for our community and our people,” said Bakewell Sr. The group also understood that the fight was not just with the police. The fight must be fought on all levels, they said. The police union and the Law Enforcement Bill of Rights must be amended and the strength, money and power that supports that bill is real. This fight will require money, time and effort if there will be any resolution. “We are going to apply pressure on those politicians in charge to try and affect change, but we also understand that they are going to be subject to attack and we must also agree to stand with them during this attack if we are going to be able to have any lasting effect in making legislative change,” said Cedric. Also on hand were music stars The Game and T.I. who addressed the audience along with television star Jesse Williams. “We see police disarm, deescalate and not kill white people every day” said Williams during his controversial speech at this year’s BET awards. Williams sentiments were echoed at the meeting.